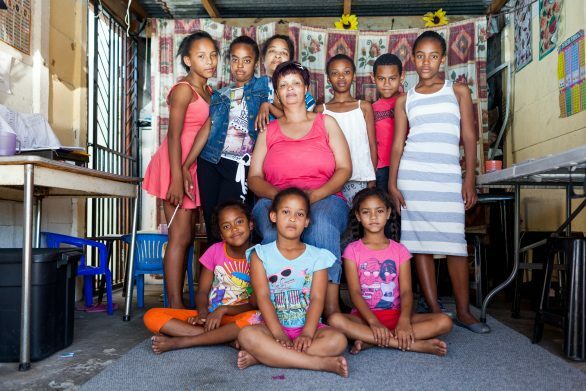 EXHIBITION 1 is a chronicle of the people of Cape Town and the many journeys they make using public transport – stopping at stations, getting off taxis and moving through different parts of the City Bowl and southern suburbs. 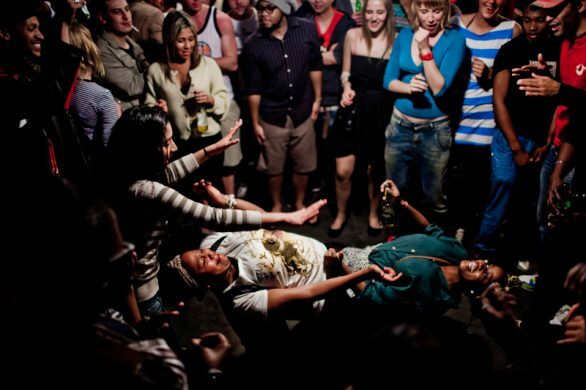 The photographs were taken over a period of seven years and focus on: the daily commute; the youth and how people navigate and occupy their city; and how the past and current segregation of Cape Town affects and shapes its people. 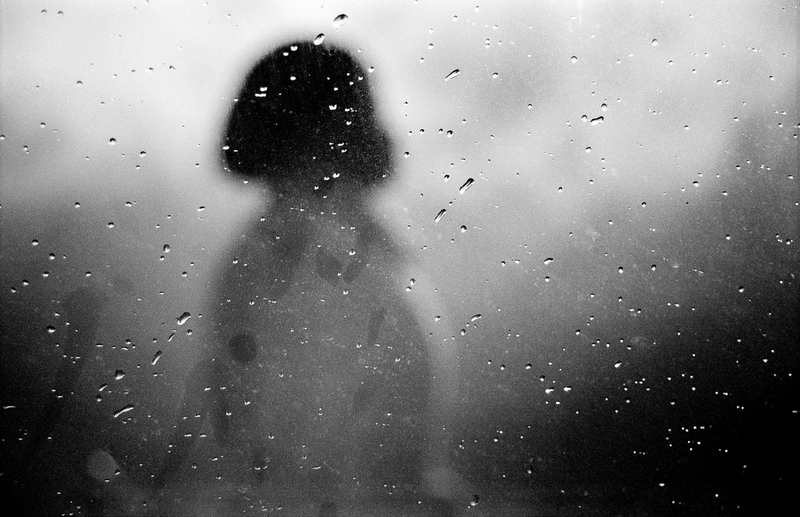 Domestic worker walking past window in Capricorn Park, Cape Town, 2009. 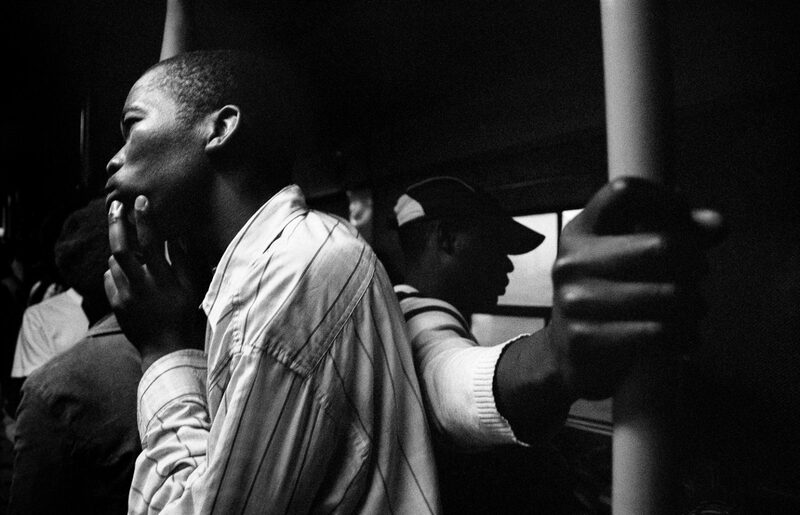 Young workers commuting via the central bus terminus, Cape Town, 2010. 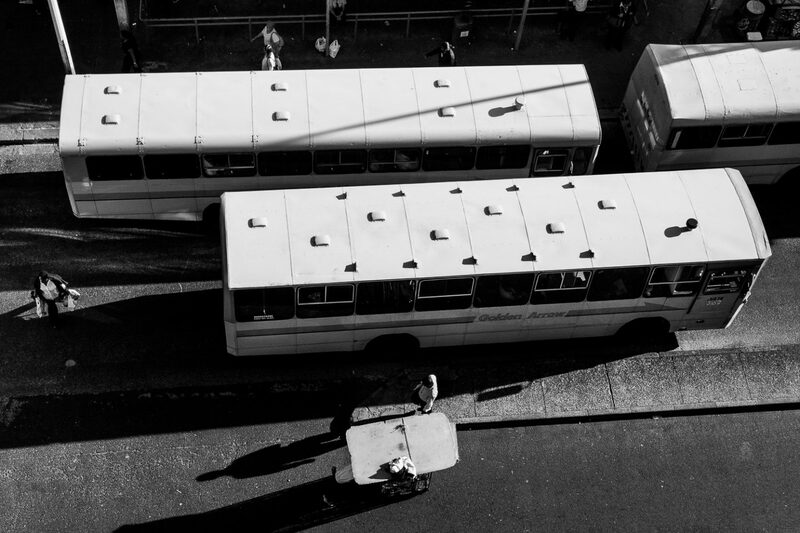 Busses leaving the central bus terminus, while stall owners are moving their temporary shop, Cape Town, 2009. 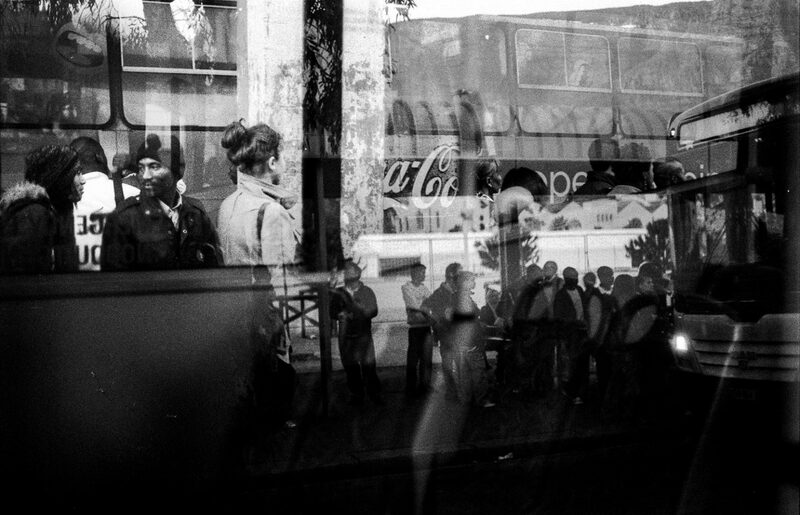 Commuters standing in line during a busdriver strike, Cape Town, 2010. 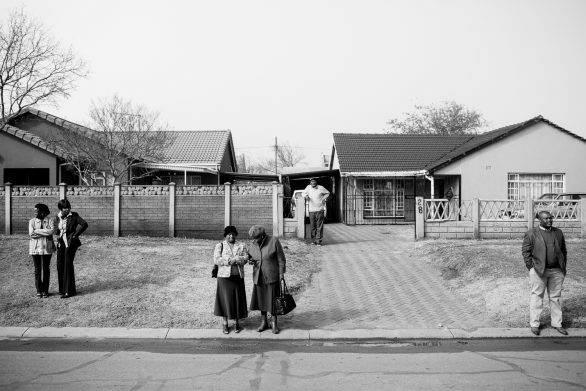 A young couple waiting for the bus to Rocklands, Cape Town, 2009. 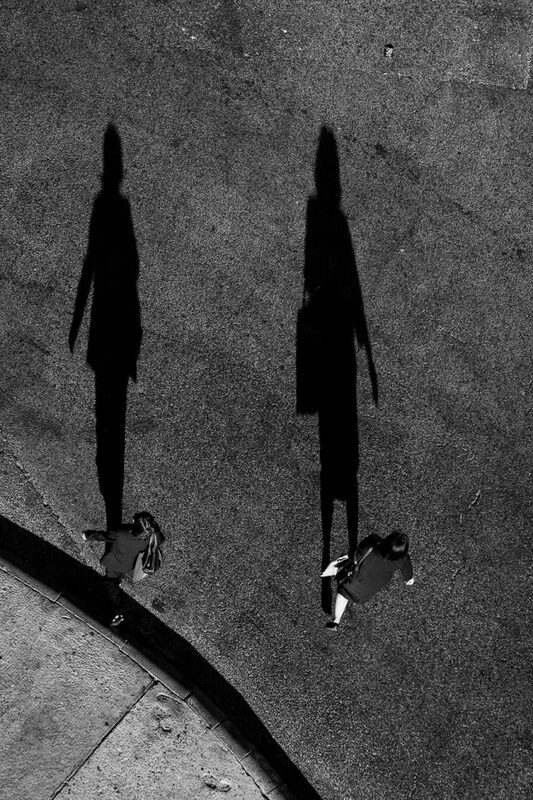 People crossing the road towards the central train station, Cape Town, 2010. 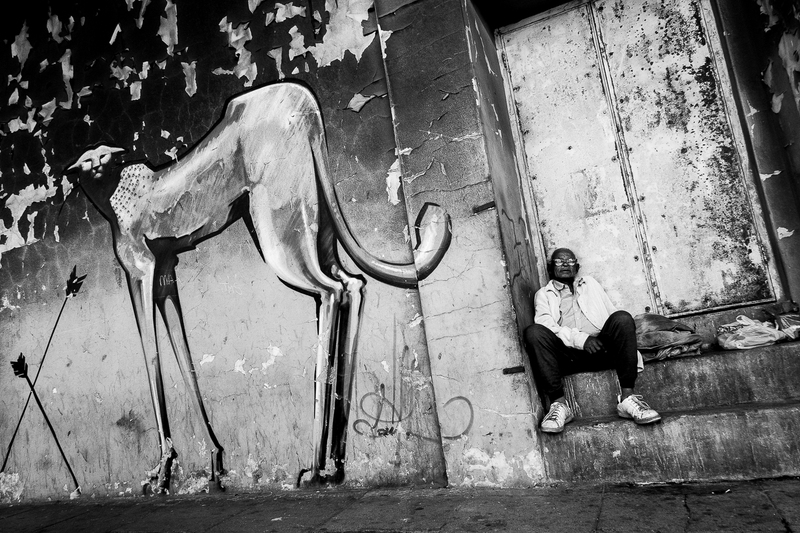 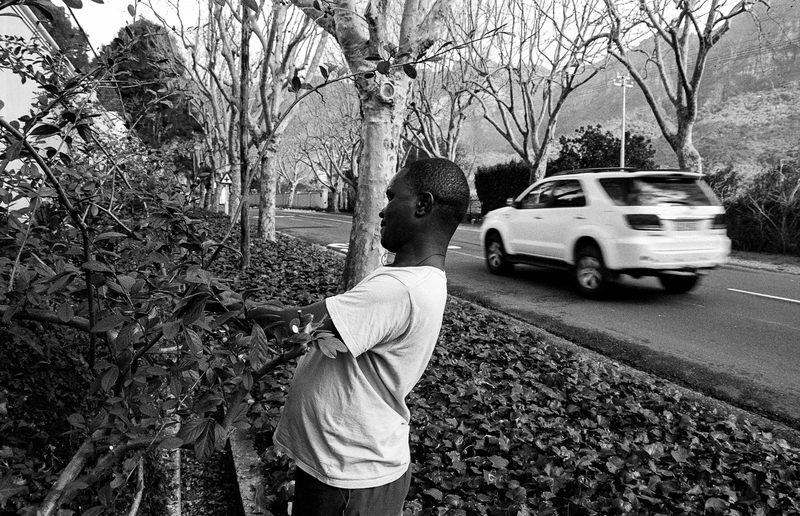 A commuter is waiting on the bus, Cape Town, 2010. 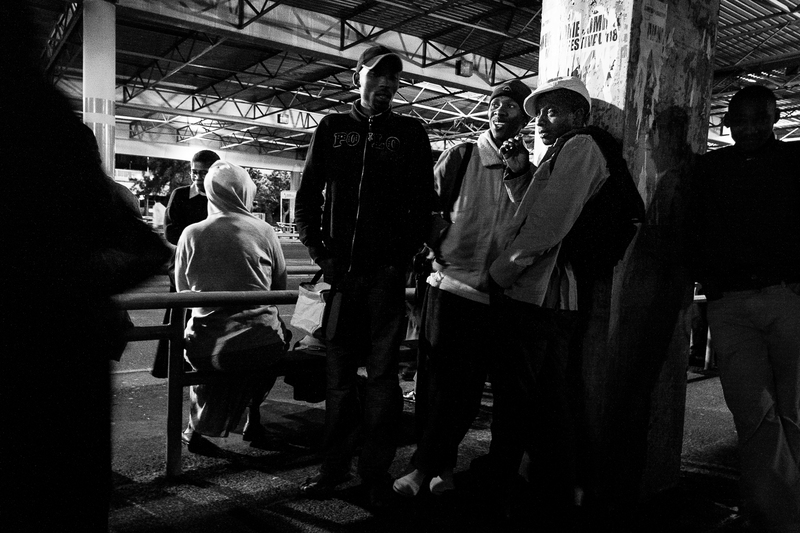 Workers on the night train to Khayelitsha, Cape Town, 2010. 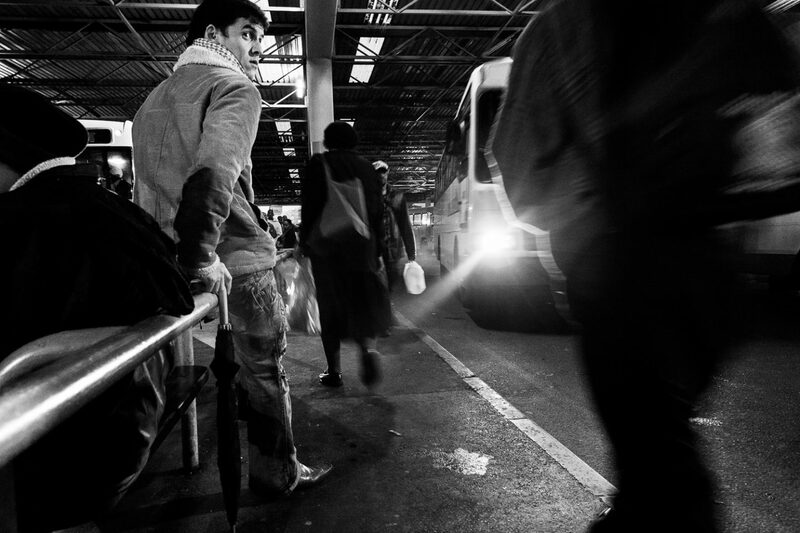 Person crossing railway tracks with shoes in his hand, Claremont, 2013. 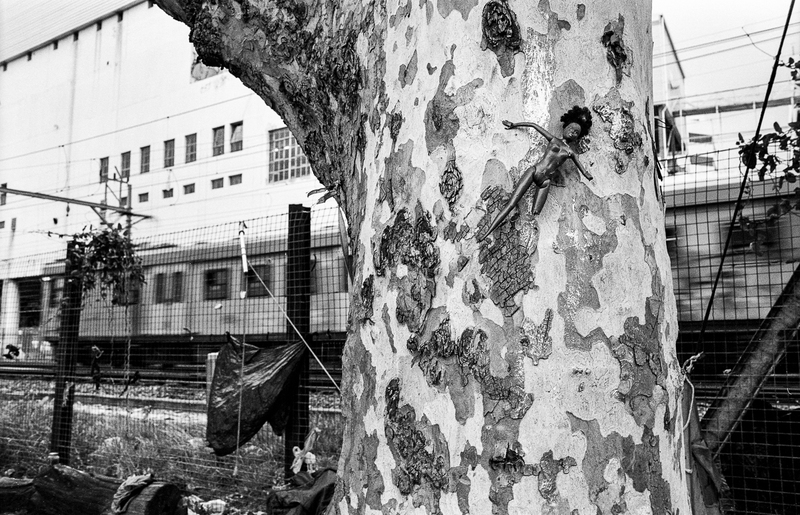 Barbie hung on tree, potentially marking a territory of campsite, Claremont, 2013. 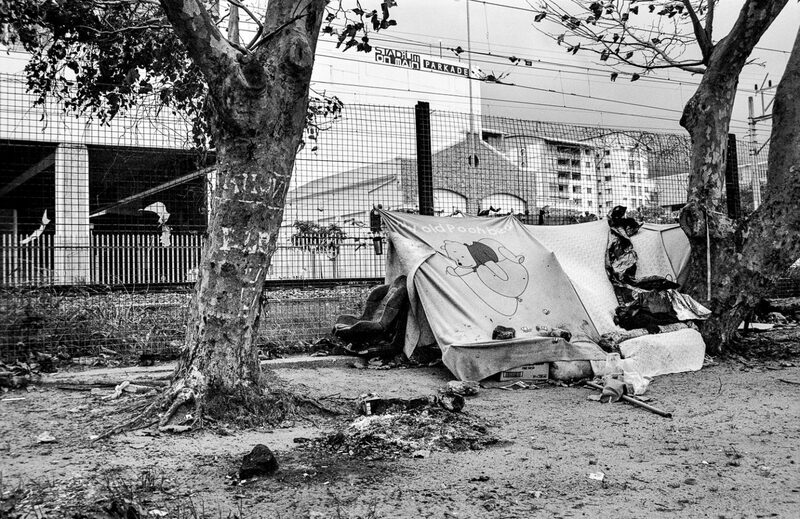 Campsite for shelter at the back of Stadium on Main, Claremont, 2013. 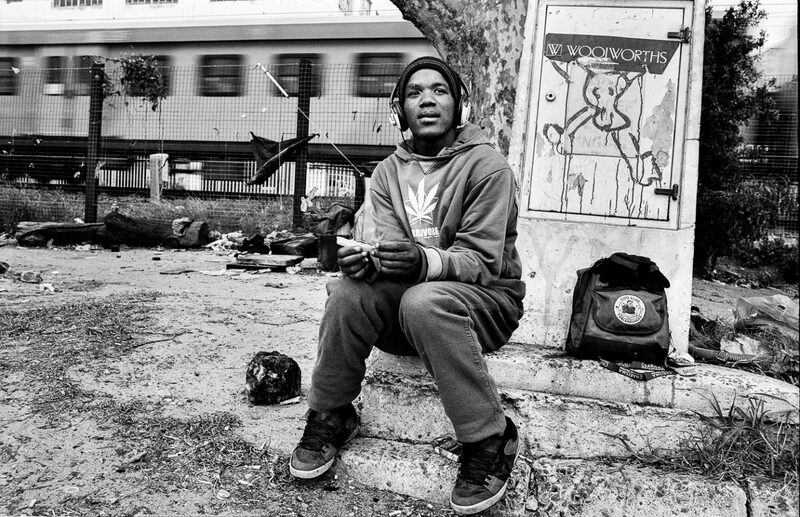 Teenager rolling a cigarette from a piece of newspaper, Claremont, 2013. 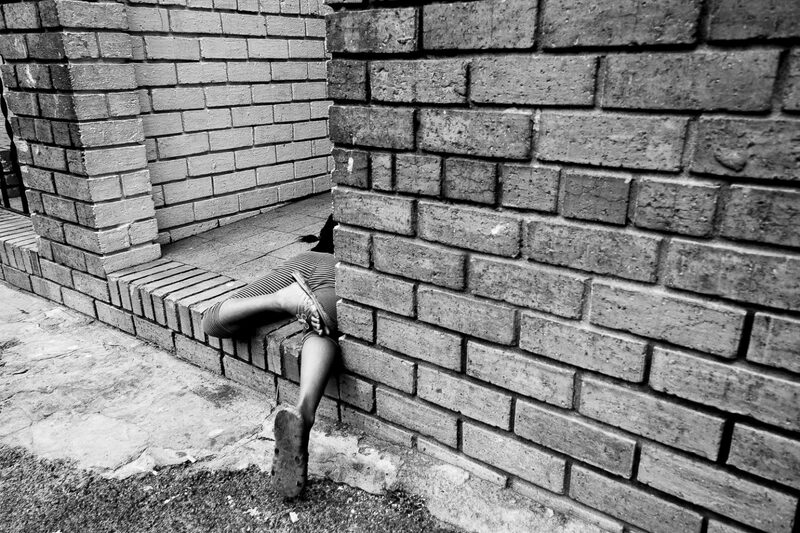 Child playing in the front yard of her home, Salt River, 2011. 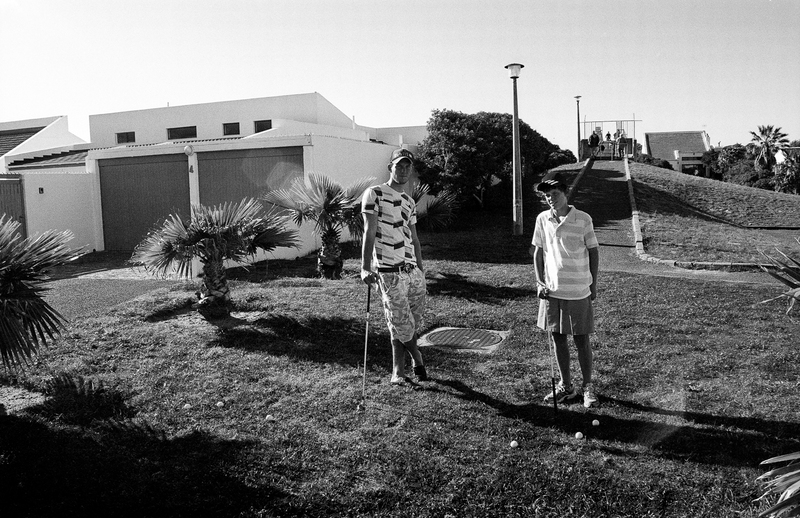 Teenagers playing golf, Marina da Gama, 2011. 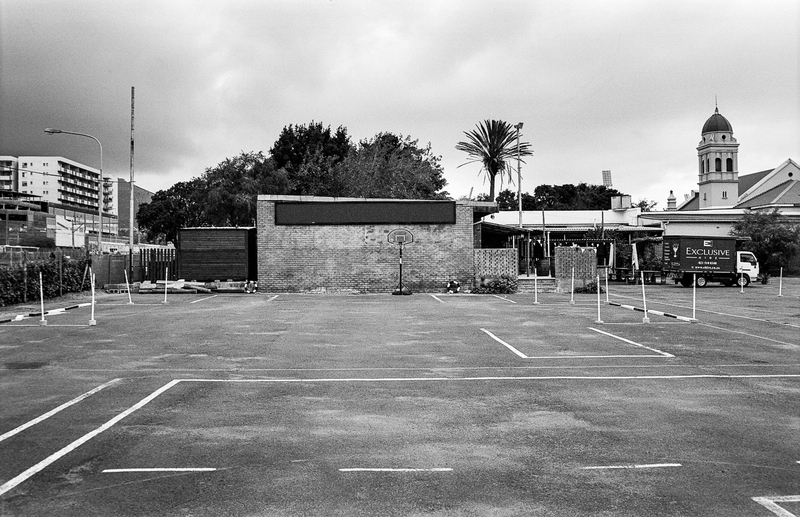 Driving school yard, Claremont, 2014. 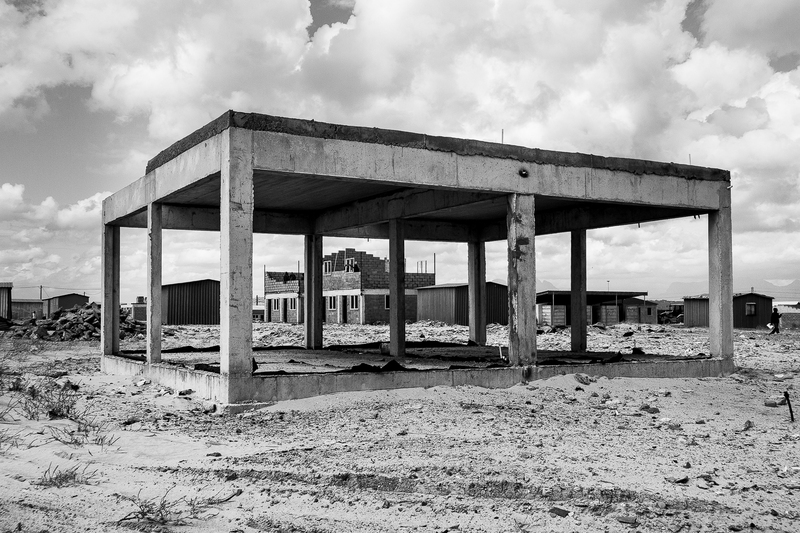 Government houses in Blue Downs under construction, Delft, 2011. 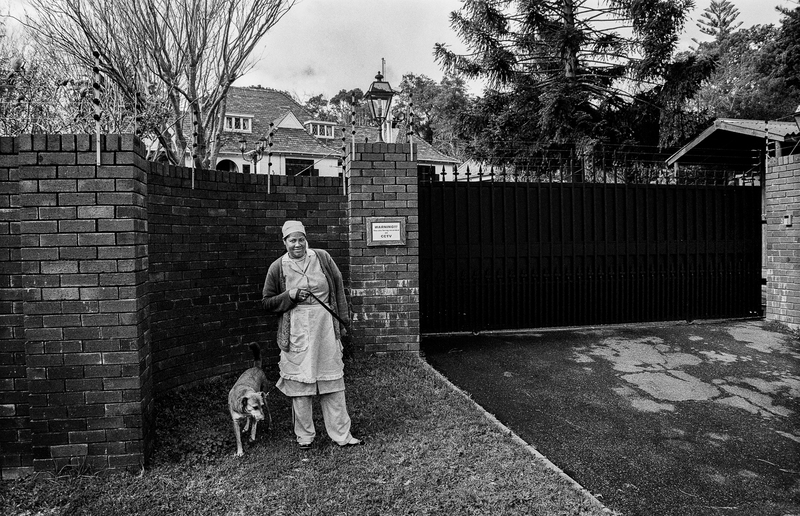 Domestic worker walking the dog outside employer’s mansion, Bishop’s Court, 2009. 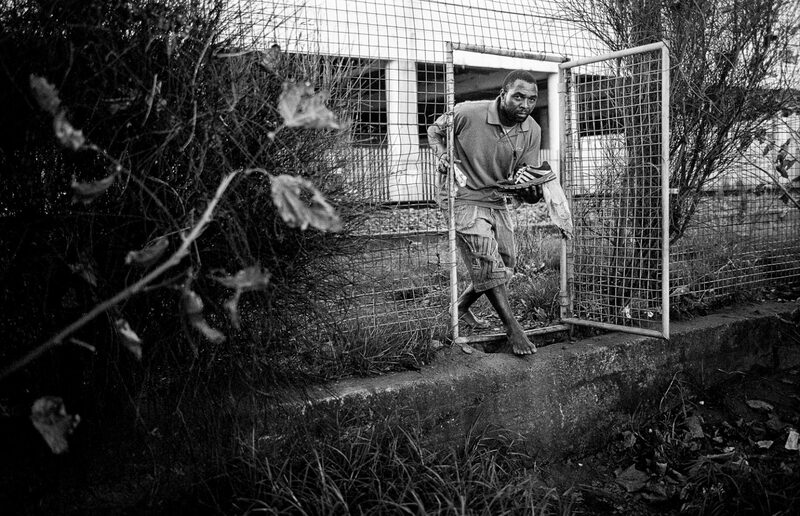 Domestic worker cutting hedges, Bishop’s Court, 2009. 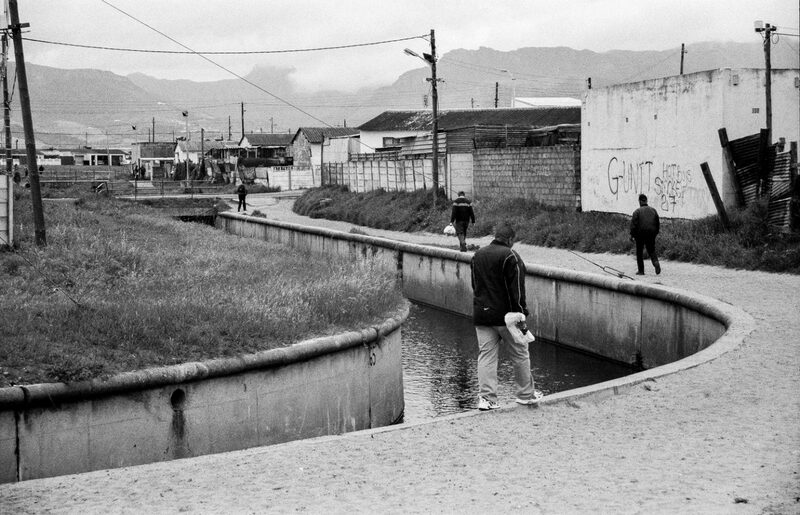 Men walking home after work, Steenberg in Cape Town, 2014. 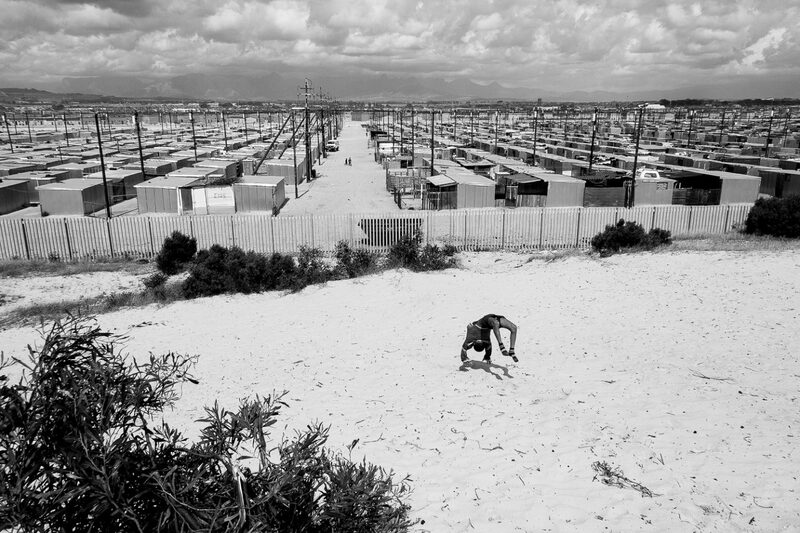 Overlooking one of Western Cape’s temporary housing projects, Blikkiesdorp, 2010. 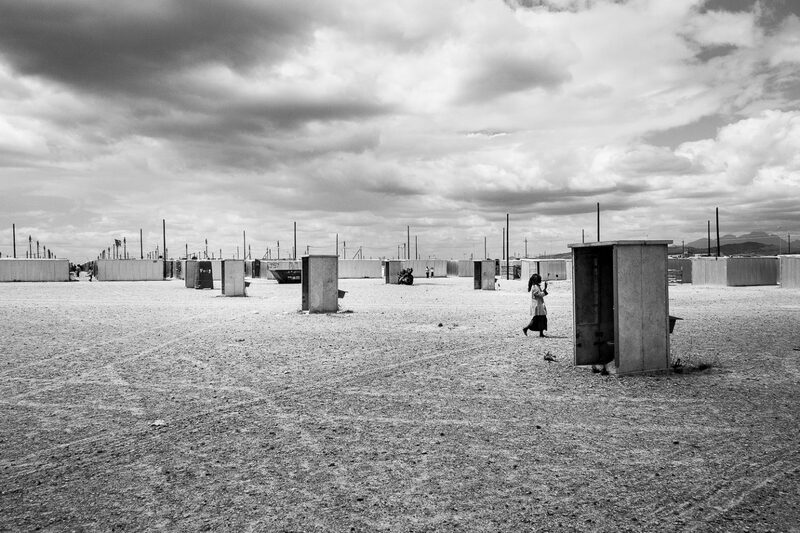 Free standing toilets built before the completion housing structures. 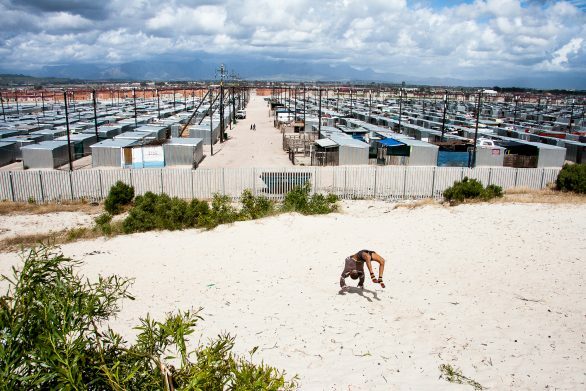 One toilet for four households, Blikkiesdorp, 2010. 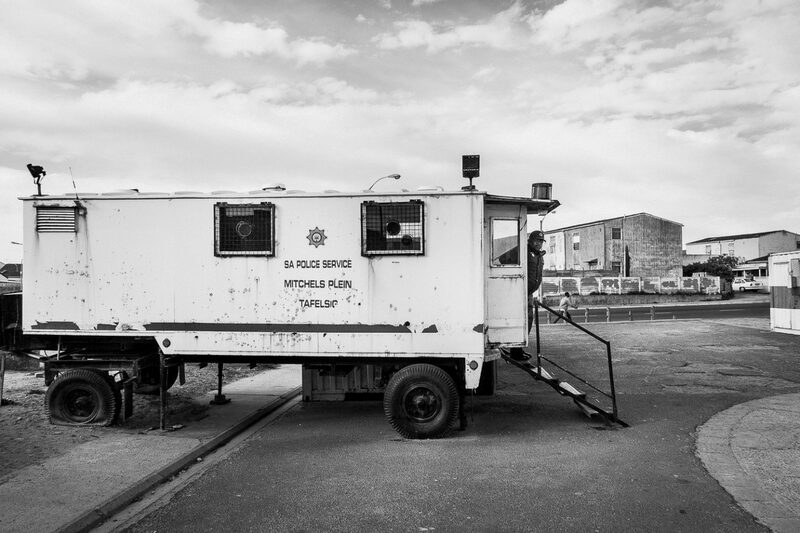 Police Station outpost for a section of Tafelsig, Mitchell’s Plain, 2011. 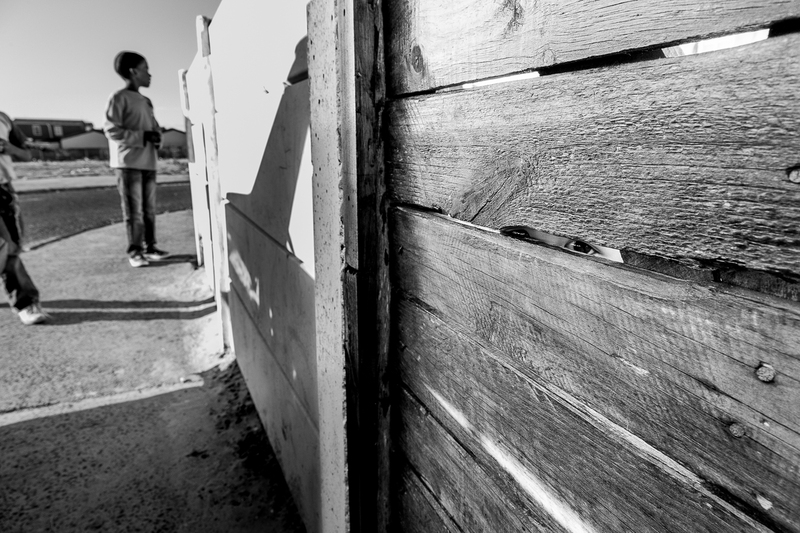 Child looking through the front gate of their home in Tafelsig, Mitchell’s Plain, 2012. 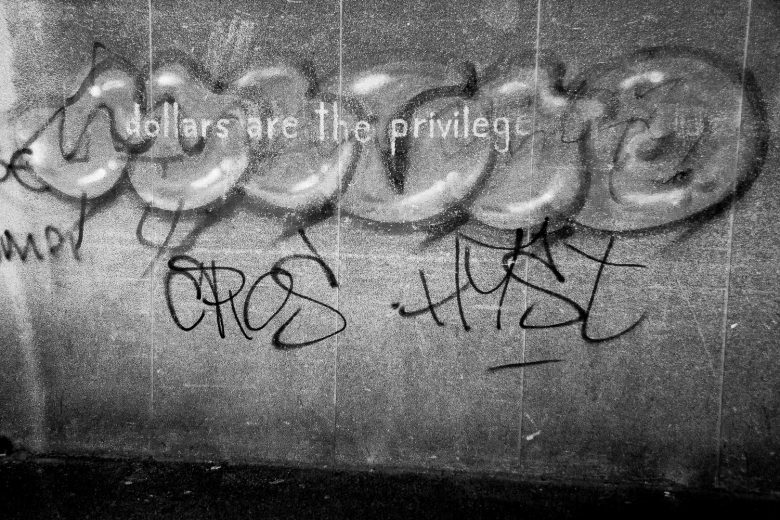 Graffiti detail: “dollars are the privilege”, Salt River, 2014. 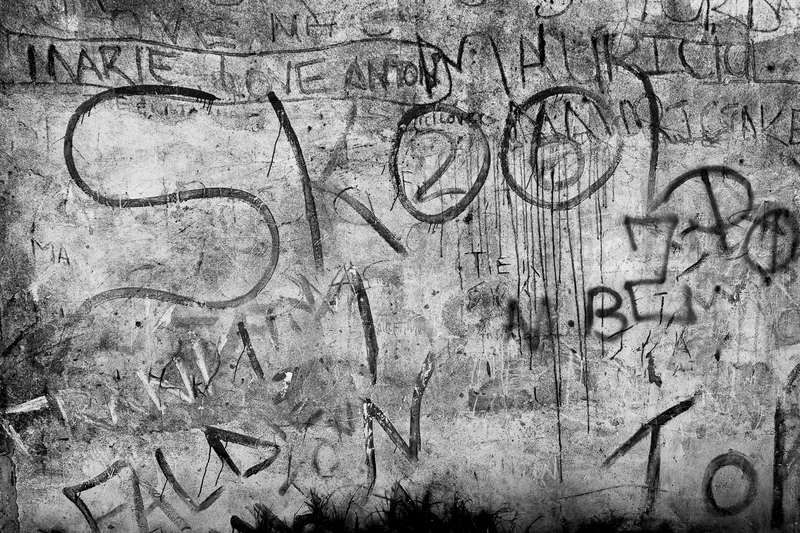 Detail of wall with the word “Skool” and gang related tags, Mitchell’s Plain, 2013. 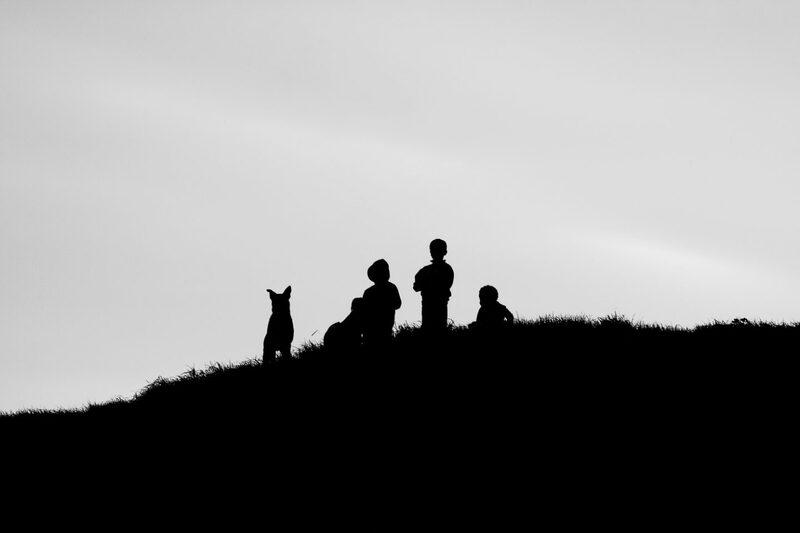 Children and dog on the hills of Karbonkelberg, Hout Bay, 2010. 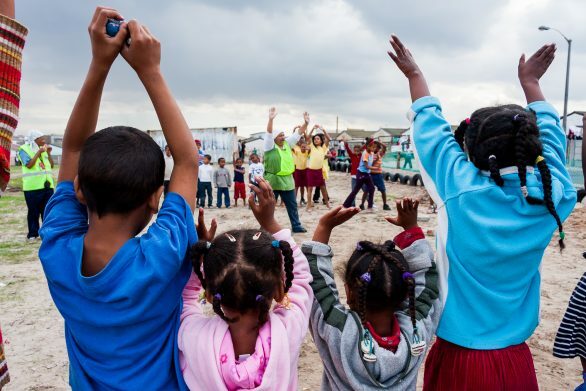 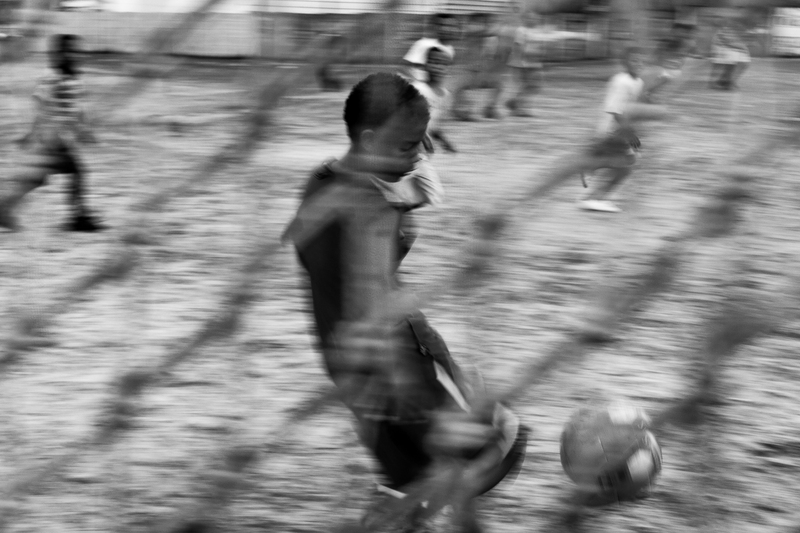 Children playing football on a community field, Mitchell’s Plain, 2011. 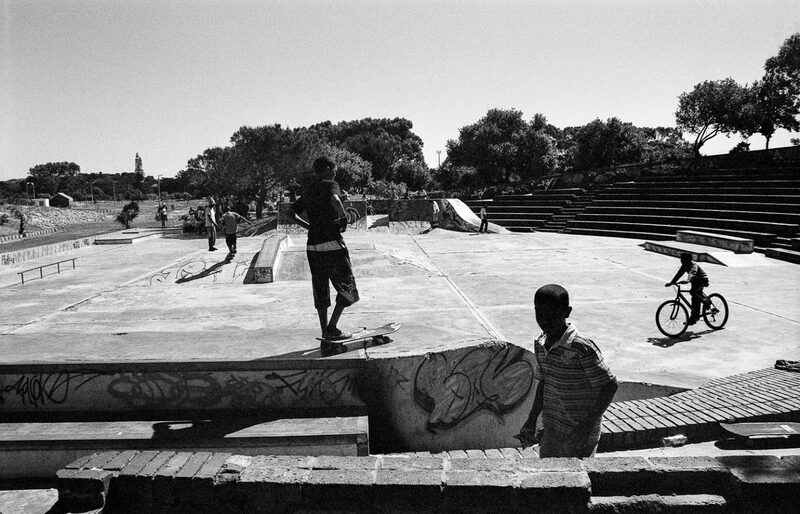 Children skating and utilising a dedicated skate park in Rocklands, Mitchell’s Plain, 2009.